I am puzzled by engraved identification marks at the back of the plates. 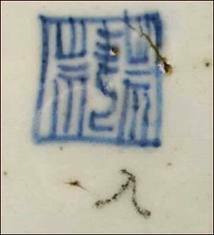 I have also seen this kind of engraved mark on the visible face of some plates, during a yard-sale in Lorient. Please, do you know what are these marks? maybe owners marks? Indeed, this is a possibility. This is not export porcelain. It might well be that it was brought abroad much later by emigrants, collectors, etc. Thank you very much, Peter. Your page about markings is exciting! 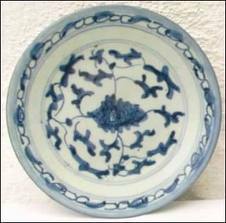 Isn't it strange, that the East Indies Company has brought back to Europe secondhand dishes? Moreover, rather usual dishes. Considering the cost of shipping during those days, it is puzzling. You are right on both accounts, that is, regarding approximate age and ownership marking. These items were made throughout the Qing dynasty. They identify the owner. 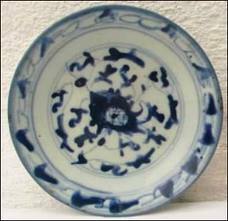 With communal use of porcelain items, the items were returned to their respective owners. Porcelain was precious in those times.